As cars are becoming more and more easily available for people, car owners usually want to pursue a more comfortable life in their cars. A multifunctional car stereo can bring a lot of convenience and enjoyment in a car and thus is becoming more and more popular with car owners. 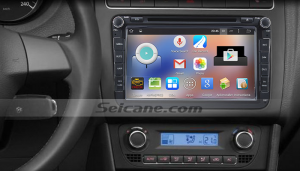 Please look at the image below which a modern 2006-2013 VW Volkswagen EOS car stereo from Seicane, you can take the following VW Volkswagen EOS car stereo installation guide as a reference if you are going to upgrade your factory radio. Wish the above installation guide can be helpful for you. If you are going to install this 2006-2013 VW Volkswagen EOS car stereo on your own, please make sure you are clear about every step before you start it. If you have any questions, you can ask your dealer or a professional for help. This all-in-one car stereo is compatible with 2006 2007 2008 2009 2010 2011 2012 2013 VW Volkswagen EOS in particular. With upgraded both software and firmware, you can have the best driving experience with the most accurate guidance and the smooth operation. Supported a large amount of multimedia formats like DVD/DIVX/MP4/MP3/MP2/VCD etc., you can keep yourself and your passengers relaxed all the way. To have a different and brand new driving experience, this VW Volkswagen EOS car stereo is your best choice. Just take it right now and start a new journey. Good luck to you!